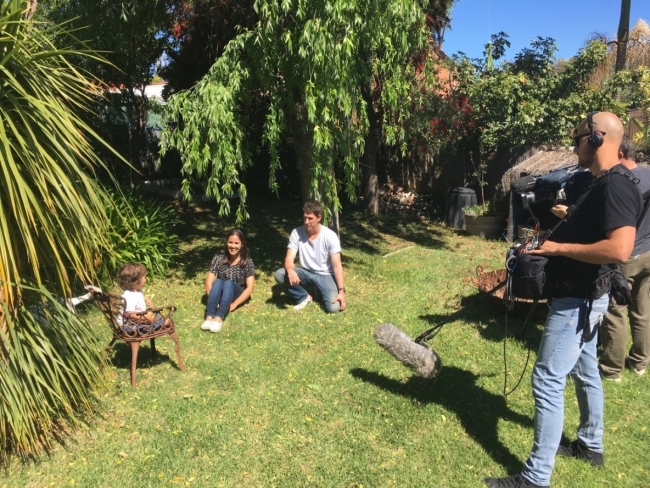 Make sure you turn on your telly soon if you want to catch a little glimpse of me, Nala, Mr Nerd and Little Nerd – and our house - in a segment on home renovating! 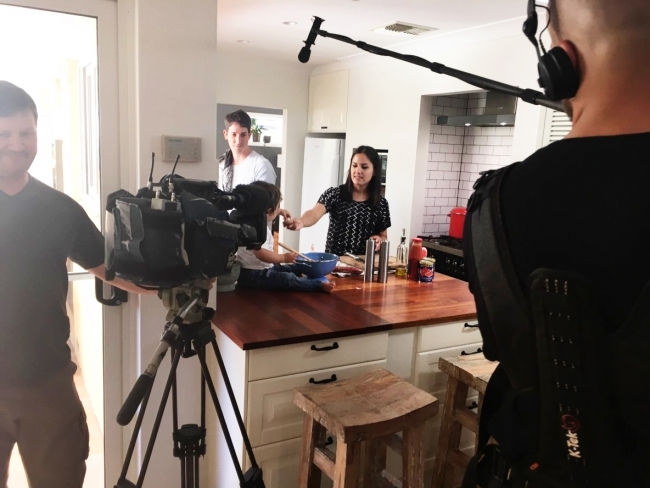 It will air Monday 14th November at 6.30pm on Channel 7's Today Tonight with the lovely Chantelle Toohey presenting. 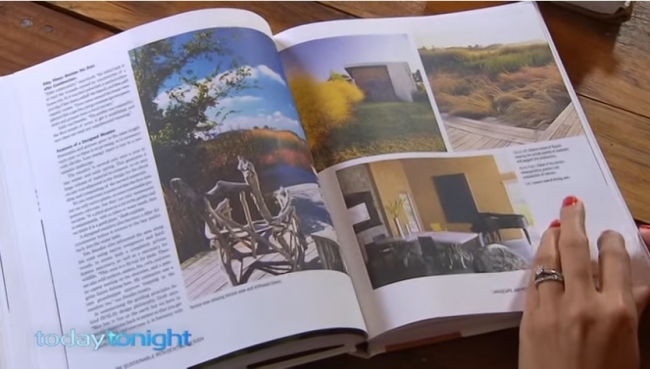 You might remember two years ago when Chantelle interviewed me for another segment on beautiful Perth houses, where I did a stellar job on camera of flipping importantly through a ginormous architectural book I had never read and pretending in a very non-creepy, not-at-all Single White Female way that my friend Carla Karsakis’s cute home office was actually my own, despite the big “Etica Studio” sign in the background that I didn’t notice 'til later. Chantelle and I in my little kitchen. But TV shooting has time constraints, people. If a TV deadline is looming and your own home office is nowhere in sight, take your friend’s. Tell no-one. Bringing my A-game to the book-flipping component. MUCH SERIOUS. FOCUSED JOURNALIST FACE etc. This time however, the segment is actually partially shot in my REAL house (and garden. 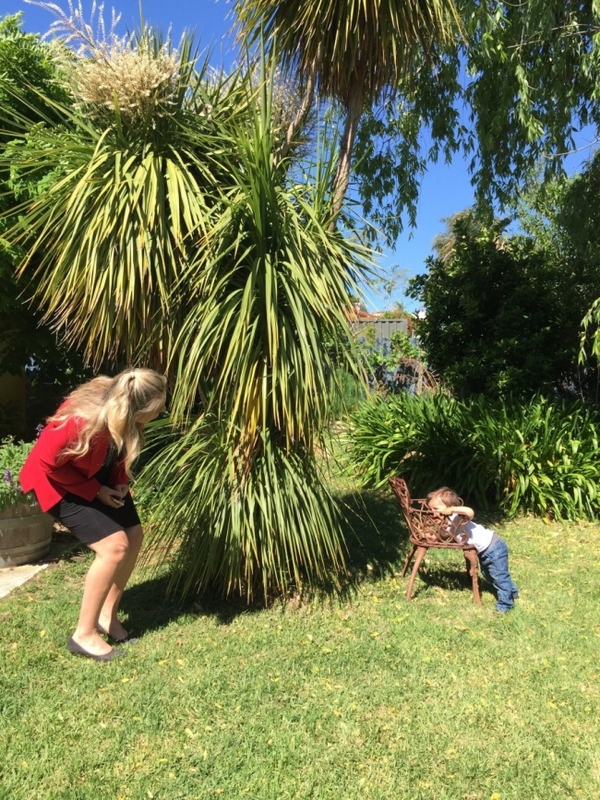 Don't look at the weeds, look at the baby!) 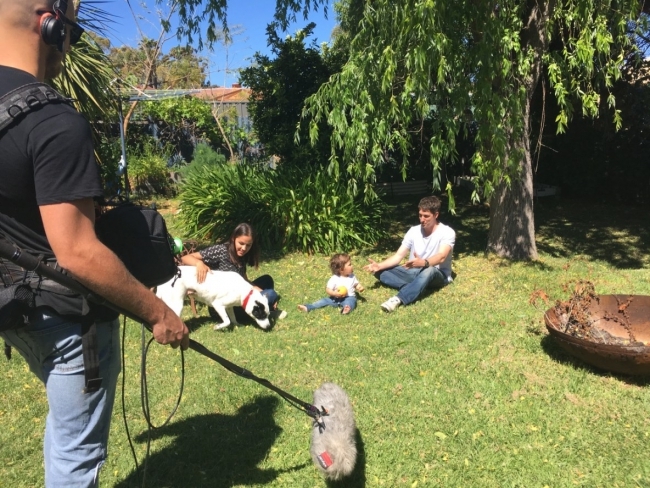 And this time, I managed to coerce my husband into doing the TV shoot with me (the dog and the baby didn’t really get a say, they are my minions). 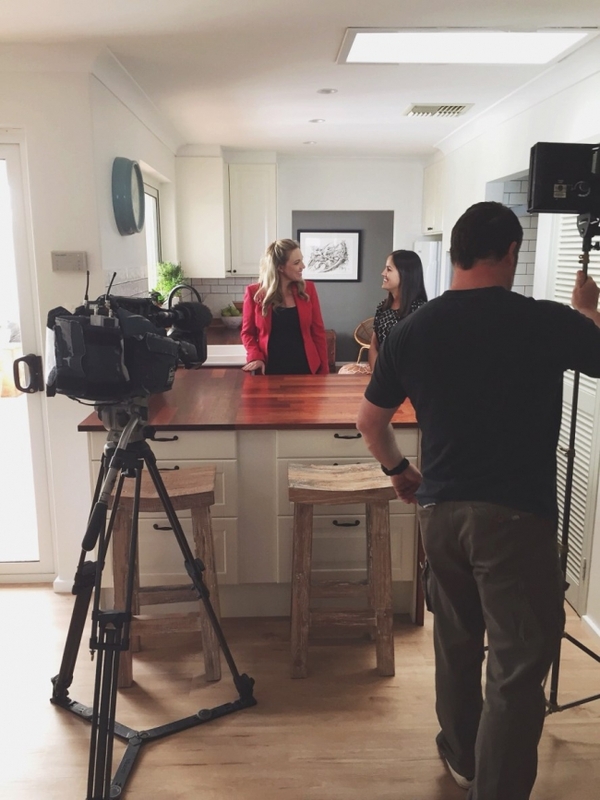 The segment is going to be on renovating – how more and more people are choosing to stay put and improve rather than move – and how if you’re smart, you can make a tidy profit. Watch it and admire how well I frantically hid away all the ugly things in our house, like the baby walker, the dog’s beanbag and the Barbie pink CD player. Well, most of the things. Of course it was only after the TV crew left that I looked around the house and noticed all these random things I had left out that got filmed. Oh well! I think now that getting a house ready for a photo shoot or a TV shoot is kind of like getting your place ready for a wedding or a party. There is only so much you can tidy or do or style in the time you have, and then you have to go, ah, stuff it, we’re out of time and just relax. Or try to relax. 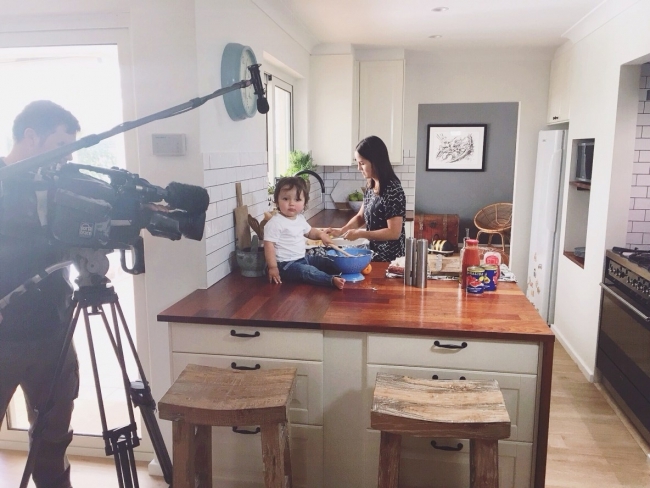 I am so not a natural in front of a camera (unlike my son, who you can see above; stirring tomatoes in his colander like he was born to do it). As soon as the camera's on, I seize up. Little Nerd flirting outrageously with Chantelle. I've never seen him flirt so hard with someone he's not met before. Maybe he will prefer blondes. But I’m still pretty excited about seeing us all on TV which I think will be a fun thing to look back on when we’re old (“Babe? Remember when I bribed you to go on TV? No? You don’t remember? You are that old?”) and my family are coming around tonight for Chinese food so we can eat dinner together while I stare in horror at the way my mouth moves when I talk. (Is it just me, or do other people watch themselves on TV and think that their mouth moves really strangely?) So yes I will be peeking from behind my fingers, same way I tried to watch The Babadook.